This painting reminds me of my last trip to Africa. I was in the northern part of Tanzania. 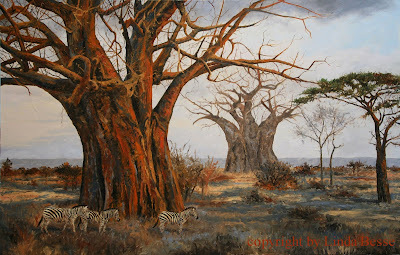 The late afternoon sun was a brilliant fire ball and its light seemed to make the baobabs glow. One tree in particular just lit up. 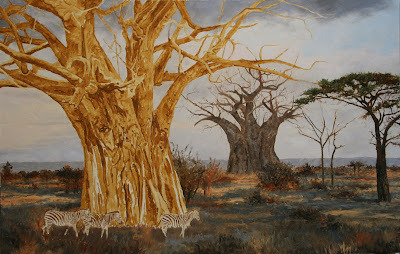 That tree didn't work for this painting, but I used another baobab and "transferred" that special light to it. I cropped the main tree because it appeared bigger when you didn't see all of it. 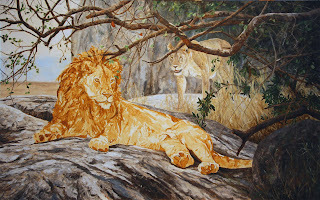 This will be my last African painting for a while since I need to get some commissions done and more North American paintings completed for upcoming shows. 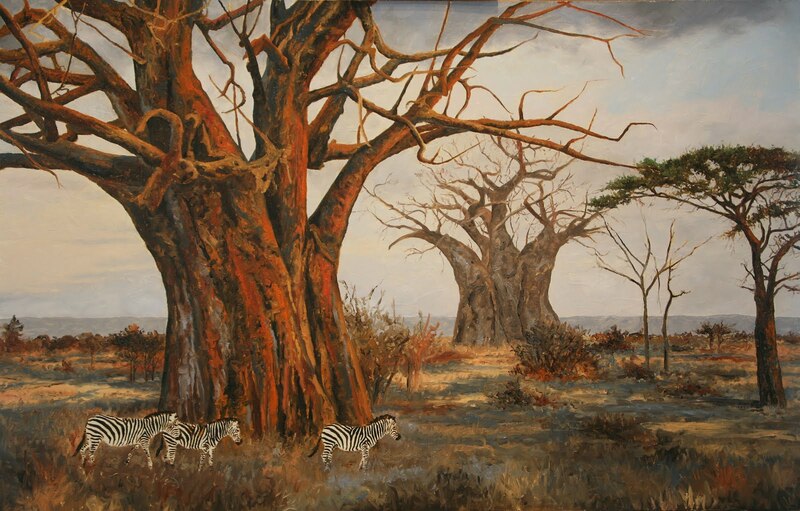 A sunset piece seems a fitting place to end this run of African paintings. It was the orange/rose which inspired me to do this painting. Contrasting the vibrant color with deep browns and blues really make it sing. A few highlights on the right tree soften the dark brown. 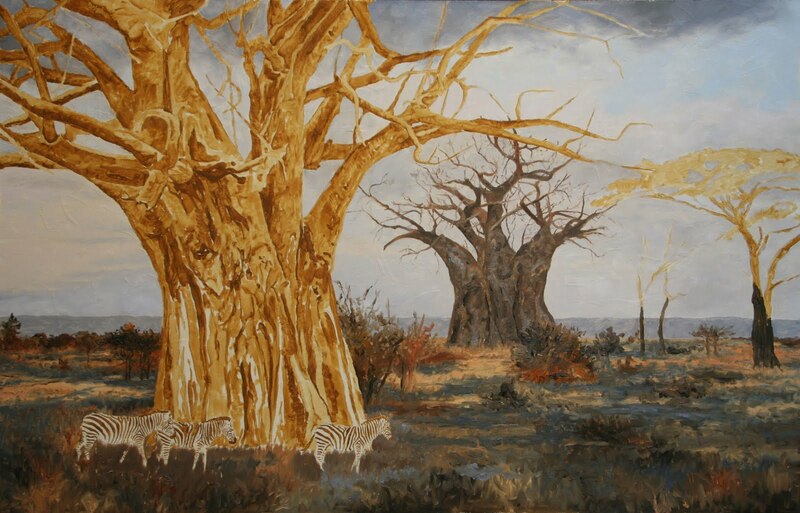 I haven't added any of the detail branches to the main baobab which I will do next. 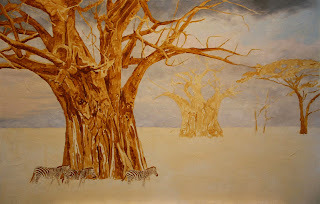 Only the dark stripes are on the zebra, and after the baobab detail, I will work on finishing them. 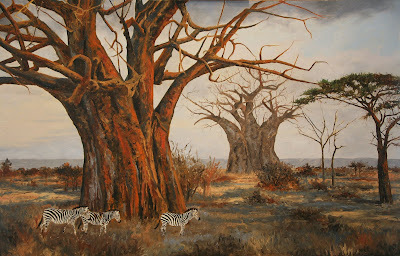 The right tree needed to have a longer trunk and the 2 thin trees to its left also needed to be longer. Some darker brush on the right side of the painting gives the side more equal weight to the left side. I think there will be more adjustments but it is time to start on the main focus. Roughing in the background can be a guessing game. Do I just paint the background baobab, or continue to the bottom of the piece? This time I opted to paint to the bottom to get a feeling of the color palette. I will adjust it as the the painting progresses, but now I have a sense of the painting's color choices. Some of my decisions have been made, such as the color of the background hills (grayish blue), the background trees, and the splashes of light. These choices will dictate some of the colors in my main tree. After each baobab painting I complete, I make a mental note that I will not paint one again. Tons of branches, then trying to figure out which is in front of which. Lots of effort for a tree! But, after some time has elapsed, I get an idea which must be painted. And it includes a baobab. I steel myself for lots of sticks and branches and plunge in. Even though it took me more than 2 hours just to put the wash on this board, I have to admit the effort was worth it. I can already see the heft yet fluidity in the main tree. 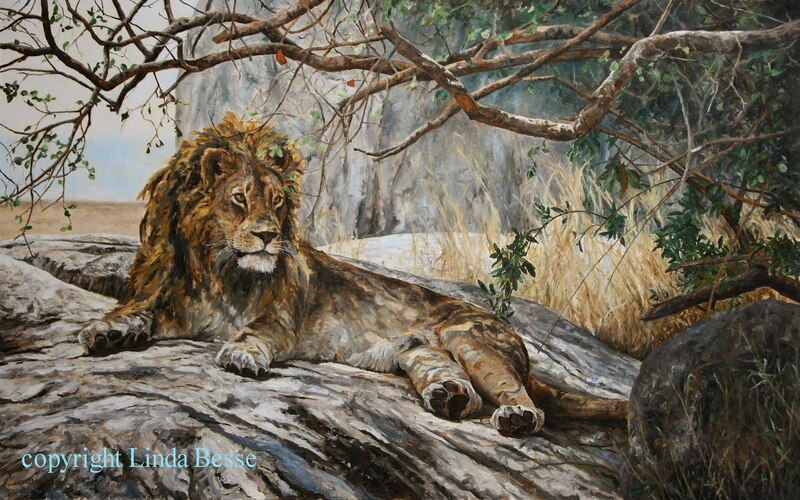 Yes, I painted out the lioness. It was a tough decision but I am glad I did. My friend Lisa saw the finished version and said, "Oh no, she's gone. You Murderer!" In her joking way, I guess Lisa is right. I did kill the lioness from the story. Sometimes as artists, we need to let go of our preconceived plans and let the painting speak. I imagine an author has to go through the same process of editing. A character who is not advancing the plot is cut from the script. As for the title, this was a tricky one. My whole story had changed and I had to see the piece from a different light. From his eyes, he is not really at rest. Shadow, shade, Rex, Simba, Respite all figured into titles one way or another and didn't work. My final choice was to note the rocks he was using for his spot out of the noonday sun. Kopje is the Dutch word for the rocky outcroppings found on the African veld. I could have used the Africaans "koppie" but I liked the sound and look of "kopje" better. The Courage of a Lion? The lion looks much more regal now with darker tones, less red, and more definition in his mane. I think his mane still needs some touch up between his front paws but it is almost there. The stick by the rock, now that it has been broken off, no longer draws my eye. The lioness has been darkened. I'm not sure she is working for the piece. My eye is drawn to her first, before the lion. I like the story she adds, but is that enough? Should I darken her further, OR, should I paint her out of the piece? I have to admit I am attached to her. 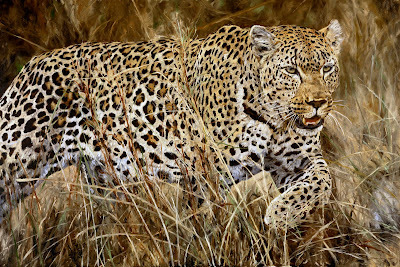 Not for the time she represents in the painting, but she has been in the concept of the painting from the beginning. It is almost midnight. Should I sleep on it or do I have the courage to make a bold decision? As a child, I remember that picture game where you had to identify all the things wrong with the image. The car only had 3 wheels, the tree didn't go all the way to the ground, the bike the child was riding had only the left portion of the handle bars. That is what I do with my paintings. Looking at this piece, I see a number of things "wrong." 1.) The stick on the right side of the painting sweeping along the contour of the rock. So distracting. It may have been there in the reference photo, but it is just not working. 2.) 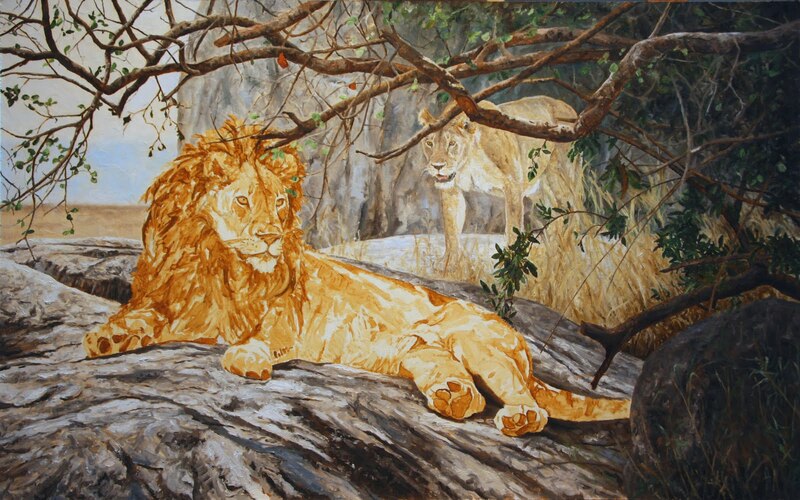 The lioness appears washed out. Maybe if I darken her and add some detail. 4.) The lion's mane needs more definition. 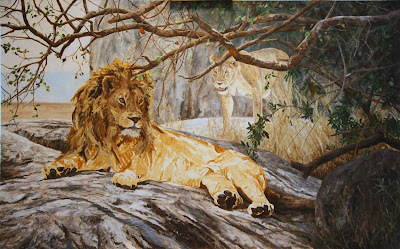 I painted the lioness soft and loose, not wanting to distract from the lion. 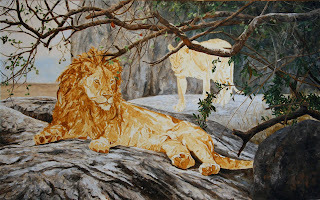 She is in the sunlit background and should have less detail than the branches. 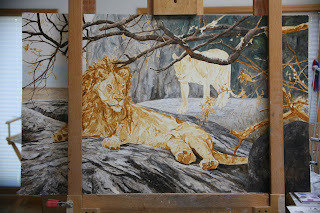 The grasses have been added and help divide the lion's rock from the rock she is walking across. ...for me, much of it is trial and error. I paint a stick in and it doesn't look right so I paint it out. Sometimes I will add one and it is almost right but not in the right spot or it angles left when it should angle right. This means a lot of stepping back from the painting, looking at it from different angles and even taking a moment outside. When I come back to the painting, I try to look at it with fresh eyes. Yes, it is back to the lion, lying. Today I am working on the rocks. Lots of blobs of light, medium, and dark which don't make much sense until I get in the branches and dappled light on him. Once those sections are painted, I will see what light/shadow changes need to be made. 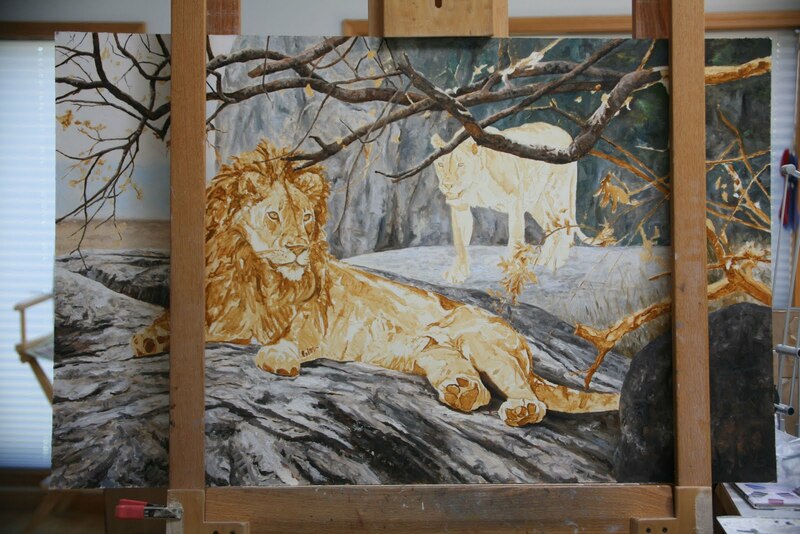 At this point, I want to leave the rocks a gray tone (cool) to offset the lion (warm tone.) The close up dark boulder in the lower right will have light colored grasses in front of it which will brighten that corner. Hmm. I am noticing a large upside down V below the two front paws of the lion. Think that will be coming out. It is interesting for me to see the piece so small after working on it and its 4 foot length. Today I heard from Artists for Conservation. 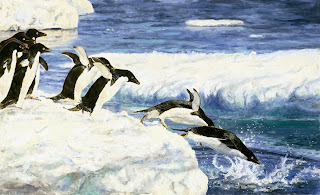 Both of my entries were accepted for the 2010 The Art of Conservation Show. This is my least favorite stage of a painting. The blocks of color can sometimes just look like blobs. If I get all fussy in the background now, it could distract from the details in the foreground. I have to wait until more detailed areas are painted to see what (if any) adjustments need to be made to the background. I find this raw sienna - burnt sienna turpentine wash stage important. It will catch some things I may miss during the composition/drafting stage of the painting. For instance, I noticed that the vertical rock wall behind the lion felt too much like a wall and too little like a rock. I made a mental note to curve it at the top to mimic the rock bolder feel I have in the rest of the painting. Also, the curving rock just behind the lion's back was too matchy-matchy with the line of his spine. I moved the rock up and will keep an eye on how it effects the overall composition. Another change was the lion's mane. In the drawing, I didn't notice the mane seemed a little flat between his eyes. Once I had the wash on, it was obvious to me it needed to be higher. I threw on some darker wash to extend it. 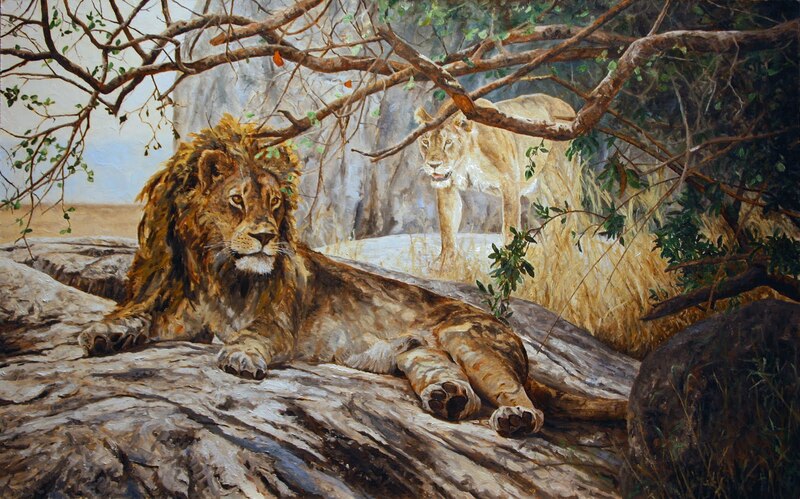 The wash also brought to my attention the section to the right of the lioness's back legs. Right now it seems very bright and distracts from the lion. While I paint, I'll want to think about how to resolve this with the planned grasses. 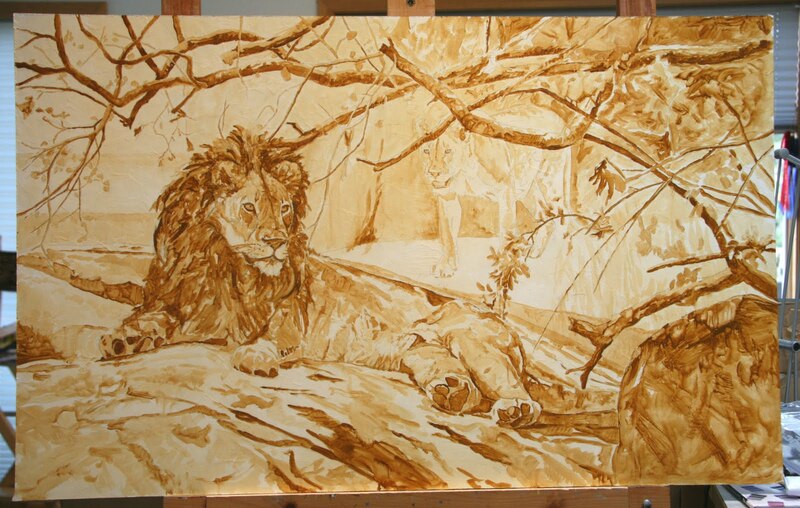 Generally a turpentine wash will take me 1 - 1.5 hours for a painting. This took me 4 hours and it revealed some details and problem areas. It also gives me a sense of the balance of the painting. Does an area need to be darker? Is the painting weighted on one side? What draws my attention and is that the area I intended for the main focus?